Let’s agree on this: you can’t call yourself a bushcrafter and have no good bushcraft knife. We all know you can’t always carry the big, bulky gear and your kind of need a bush crafting knife- unless you want to not play it safe out there. It’s not sure you can survive out there with a single tool-even if it’s the sharpest or strongest machete. But not all survival situations can be rescued with a machete and a good knife; sometimes a bush craft knife may be the key when out in the wilderness. What makes a good bush craft knife? Let’s get things straight from the very beginning: there is not good bush craft knife, unless you know to use it right. No bush craft knife can save your life unless you know how to handle it, to get the best out of it. A bush craft knife can be a true life saver on a bright shiny day, but it can be totally useless on a rainy day. You need a stainless steel blade with a lower hardness or HRC knife when you go to the beach, for instance. When you come to give a good thought, you realize that lack of fresh water, salt in the air and in water –all of these might make a carbon steel blade knife corrode way too fast. Do use a carbon steel knife though when camping in dryer wooded areas as this steel is strong enough to split and carving dry wood. But these are only some tips when it comes to selecting your bush craft knife. The most important aspects on the bush craft knife are: the materials, the features, its design and also the fit in your hand. Get a look at the finish and the extra-features-as they count for special occasions. Don’t get carry around when checking the blade of the bush craft knife; bigger doesn’t always mean better! For most of the real life experiences, you will find a big bladed bush craft knife difficult the manage, to say the least. This doesn’t mean you should settle for a small blade either as it’s not good for the intricate jobs. Try to place yourself in the middle of things and look for the knives with blades ranging from 3.5” to 6”, according to your needs and likings. The blade should have a long flat cutting edges that meets a tip, placed in the middle to the width of the handle and the grip. The tip shouldn’t be too narrow, blunt, pointy nor rounded either. A flat blade is useful when you chop, push cuts and the centered point gives versatility to your knife. 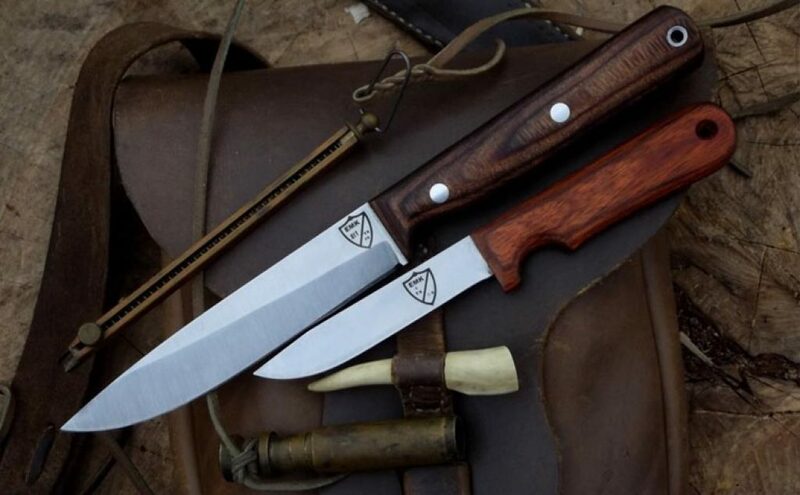 Spear point and drop point are the most popular designs on the blade of the bush craft knives. We also need to talk a bit about the blade grind and the best options are convex, Scandinavian, flat grind and chisel grind. No, we’re not going to forget about the cutting edge and the larger it is, the stronger (but also duller) the cutting edge. Skipping all the details, a thin edge is good for slicing, whereas for the chopping jobs you would need a thicker cutting edge. Remember the part on how you handle your bush craft knife? This is related a lot to the handle, or the handle material to be more precise. Leave out the action movies and stay away from the bone/antler or horn handles as they crack far too easily. Don’t miss out though the good stuff: Micarta, G10 and wood as they don’t crack, warp not rot even in the most challenging conditions. As for the features, it’s better to get a bush craft knife with a full tang. The steel runs all the way on the knife, from point to pommel so that the knife doesn’t crack when strong force is applied. It’s not just one word, as a matter of fact. We feel we owe to it few more tips, like stay away from double sided blades. Try not to fall for the looks and don’t get a saw toothed or a sharpened spine as your bush craft knife. If you are determined to get a saw, get yourself a lightweight model anyway. There are many options as bush craft knives out there but only one is the best for you. The one that you can easily use and saves your life, if, God forbid, should be the case. Just because you want to pay less (for various reasons), it doesn’t mean you can’t get good quality bushcraft knives. A good example on this is the Morakniv Bush craft Carbon Steel Survival Knife. The fixed blade of the knife is made of thick carbons steel blade with anti-corrosive black coating. The blade is razor sharp and takes well so many jobs. The blade is durable and remains sharp for a long time. You only need to oil it from time to time in order to keep corrosion at distance. The knife has a Scandi grind which doesn’t let the knife slip off easily. The knife bites into the surface and doesn’t remain stuck. As the blade is not very thick, you can use the knife for carving, batoning or other challenging outdoor activities. The sheath has an included diamond sharpener and holds a Moarkniv Fire Starter that yields 7,000 strikes and gives you 3,000 degree sparks. The fire starter works even when wet. The sheath also comes with a removable belt loop and belt clip that keep the knife safe in place. The knife presents an ergonomic handle with great friction grip. The knife rests nicely in your hand, without slipping. The knife has a solid build and a good weight. It’s well balanced and versatile. All in all, for a good price, you get a versatile, strong and sharp bush craft knife that is there for you in the wilderness. It’s all clear by now that a bush craft knife, in order to be efficient, doesn’t have to be sophisticated, but simple, easy to use and…efficient. You can’t go wrong with a knife like the Helle Fossekallen Knife that is up for all sorts of tasks when camping/hunting/hiking. The knife features a triple layered laminated stainless steel blade that is strong, sharp and durable. The knife helps you with skinning, carving and all sorts of other jobs in the wilderness. The polished blade ensures performance in many situations and also looks nice. The Scandinavian blade grind is efficient and reliable. The handle is handmade using Curly Birch. The classic appearance and design give the knife a special look, that never gets old. 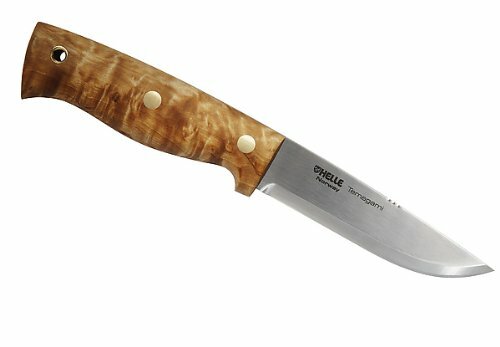 The waxed curly birch handle completes the long lasting appearance of the knife. The handle leaves a nice feeling to the hand and makes the use comfortable, with minimal strain for the hand. Every knife comes with a custom made full grain leather sheath that protects the blade. You can easily carry or store the knife in its sheath. The sheath has also a nice design and the knife easily glides inside of it. The knife is lightweight, yet strong and ready to take the heavy use in the outdoor activities. The knife has a great shape and is very well balanced. It has a good build and it’s made to last for quite some time. When it comes to the parts we like less, we only need to mention that some may find the stainless steel blade to be a bit too shiny. But this has nothing to do with the performances of the knife. All in all, for a fair price, you get a reliable, lightweight knife able to help you with so many jobs out there. Get a powerful appearance with a bush craft knife that brings also great performance when you’re out into the deep woods with the CDS-Survival MOVA-58 Stainless Steel Outdoor. The knife has an aggressive look and its leather sheath completes the look. The knife is versatile and can take various survival jobs when camping/hiking/hunting. The Cocobolo wood handle it’s not just looks. It is very durable and the knife slides in smoothly every time. It gives a good grip and it’s easy to attach thank to its lanyard. It has a compact shape and fits comfortably in your pocket. The knife has just the right weight and a very good balance. It gives a sturdy grip and leaves a comfortable feel to your hand. Along with the knife, you also get a Sharpener stone and a fire steel. They are pretty good and help you when in need. The knife is well made, far away in Spain. Considering its price, the knife is a reliable, versatile, strong and durable option when you plan to stay alive while hunting. When you say Spyderco, it’s sure you’re going to get a good quality tool, no matter its utility. 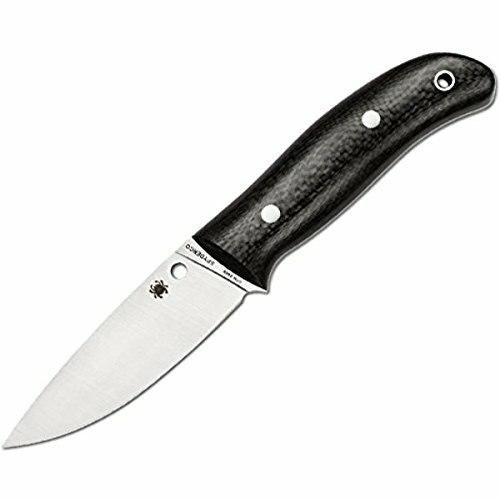 The Spyderco Bush craft G-10 PlainEdge Knife with Leather Sheath is made with high quality materials and is designed by the tactical bush craft expert Chris Claycombe. The knife is fully tanged and the four-inch blade has no hand guard. The knife features Scandinavian grind and is ready to take your heavy jobs. The Scandi edges come with single bevel grind, wide and flat so that you cut strong. The knife takes well twisting and hacking. The 0-1 steel’s high carbon blade has a keen edge over intense use. The handle is made of long lasting G-10. The grip is sturdy and the knife leaves a good feeling in the hand. The backup lanyard hole is functional and the knife comes in a long lasting leather sheath. As its overall blueprinted, the knife is ready to task various jobs in the wilderness: whittling, chopping, game processing. The knife is well designed and ensure comfortable use for both left and right handed. It’s build to last and very well balanced. All in all, when in need for a versatile, long lasting and strong bush craft knife, the knife is a sure buy. When you are determined to only buy once a bush craft knife, then your kind of have to pay the extra buck, but it’s totally worth it in the end. A very good example on this is the Spyderco FB36CFP Hunting Fixed Blade Knives that brings great performance when out in the field. The knife is designed by the famous Clay Comb and nobody know better what you need on a bush craft knife like a survivalist like him. The knife is made of CPM S90V stainless steel, with a plain edge blade. The blade is razor sharp and strong. You can pretty much do everything you need when out in the field with the knife. The solid carbon fiber scales on the handle are a great detail. They are machined and contoured for the most comfortable grip. The handle not only gives great fit, but also doesn’t create any hot spots, not even in the beginning. The grind is full and flat and quite different from the traditional Scandinavian grind. The knife comes in a leather sheath that protects the blade when the knife is not in use. It’s comfortable to wear it on your belt and it’s easy to take out/slide in the knife. The craftsmanship on the knife is great and the finish is amazing. The knife has a good weight and great balance. The cons aren’t major things though, and the knife is a great option when shopping. Just because you don’t want to pay all your money on a bush craft knife, doesn’t mean you should settle for anything less, when it comes to quality. The Benchmade Bushcrafter Knife is a good example of how you can get great quality for a fair price, lower than you’d expect for the performance you get. 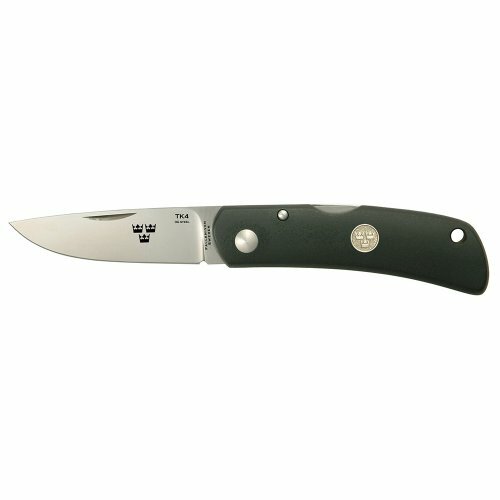 The full tang knife has a strong S30V stainless steel blade (58-60 HRC) that is able to take so many jobs out in the woods. This type of steel doesn’t corrode nor pit either. The smooth polishes blade glides easily every time. The hand-blended handles are green and feature red vulcanized spacer. They are held together with pressed titanium tubing, which makes them durable. The grip is sturdy and doesn’t slip. The knife has a good build and a nice weight. It’s well balanced and fits perfectly in the hand. The knife is easy to take care of and needs little maintenance. 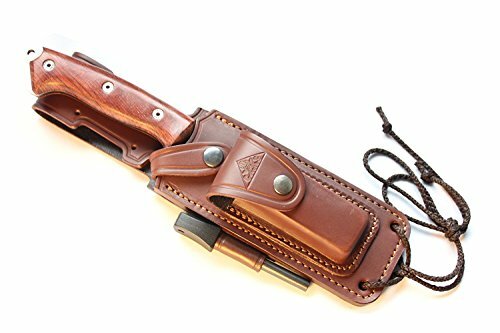 It comes in a useful, functional and long lasting leather sheath. The knife fits just right in the sheath and you don’t need to work to get it out of the sheath. The D-ring and flint rod loop, along with the retention strap, are useful details that bring more comfort to the use. The blade is sharp and the knife is reliable in many situations. As the cons aren’t deal breakers, we think the bush craft knife is a good option when your budget isn’t the biggest out there. 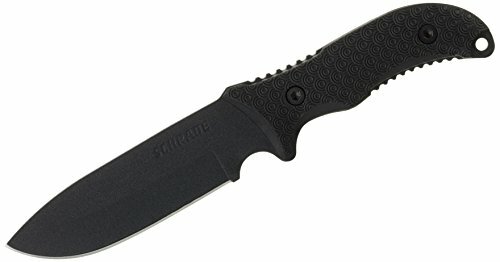 When your budget is so tight that you don’t even know how much money you can afford for a bush craft knife, spoil yourself with a low budget, yet good performance knife like the Schrade SCHF36 Frontier Full Tang Drop Point Fixed Blade Knife. The knife comes with a 1096 High Carbon steel drop point blade. The blade is power coated and features finger coil also. The full tang fixed blade knife is razor sharp and thick. The blade is strong and durable and it has just the right length. The ring textured TPE handle features spine and grip jimping. The handle gives you a cozy, yet sturdy grip and leaves a nice feel in the hand. The lanyard hole makes the knife easy to carry around or to hand on your belt. The knife comes protected in a black nylon belt sheath that is made of strong, durable cordura nylon. The blade has a good geometry and is highly functional in all kinds of outdoor challenges. The knife has a good weight and a nice balance. All in all, for a very low price, you get a reliable, pretty good bush craft knife and a great deal for some time. 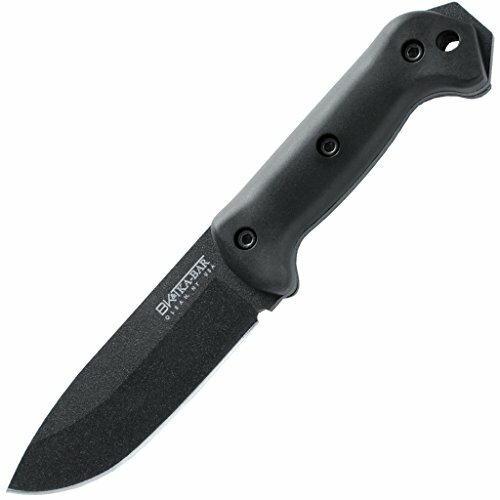 When you have a fix budget for your bush craft knife, you can still get a good quality, pretty performant knife like the Morakniv Bush craft Carbon Black Tactical Knife. The knife comes with a fixed blade that is razor sharp. The blade is made of thick Carbon steel with tungsten DLC. The anti-corrosive black coating not only protects the blade, but also looks knife. You may also oil the knife from time to time to keep corrosion at distance. The blade is on the thin side so you can easier carve, but it’s strong enough to take some batoning or other difficult tasks. The spine of the blade is ground so that you can also use it with a fire starter (not included, though). The handle has an ergonomic design with a high-friction rubber grip. The knife has a sturdy, comfortable grip and you are able to have a good control over the knife. 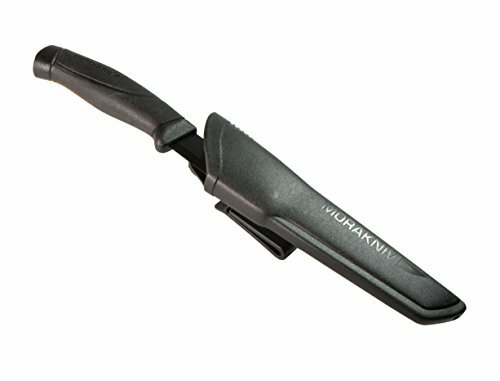 The non-slip handle lets you safely use the knife in wet and cold conditions also. The knife comes in a black plastic sheath that protects the blade. The belt loop on the sheath keeps the knife safe at your side. The sheath has a simple, yet efficient design. Despite the minor issues, for the money you pay, you get a good, reliable bush craft knife that handles very well many outdoor challenges. 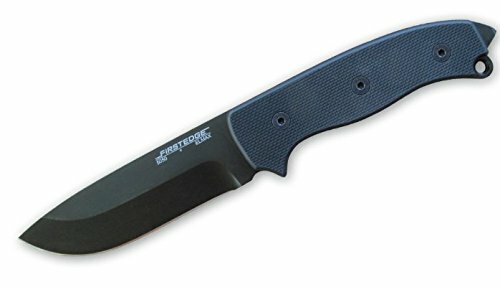 The Ka-Bar Becker BK2 Companion Fixed Blade Knife is a strong knife, ready to take on the heavy-duty jobs when going outdoors, that comes with many good features and only few flaws. The full tang knife is up for the duty field, camping tasks. The knife comes with a long lasting, 1095 Cro-Van steel blade so it takes various jobs: skinning, chopping, splitting kindling. The design is though out by Ethan Becker, a well-known survivalist. There are several features on the knife that make it right for the outdoor activities. The flat grind, the sharp blade. The drop point blade shape and the 20-degree blade angle give you a durable, strong knife. The blade is sharp and strong and the knife is lightweight. It’s well balanced and is built like a tank. The handle of the knife is made from Grivory which ensures good, comfortable grip no matter the outdoor experience. 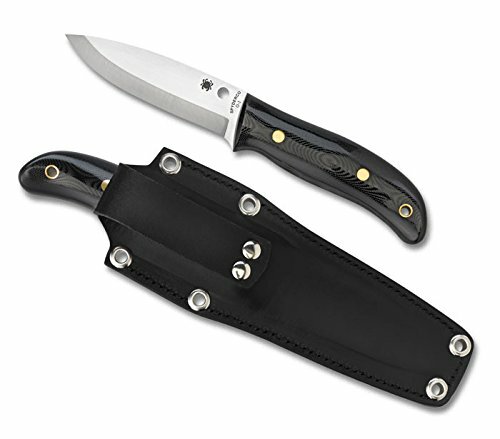 The knife comes in a black nylon sheath, glass-filled. Don’t get fooled by the plastic, as the sheath is both durable and able to protect the blade of the knife. The knife features several lanyard holes, which give you the chance to find the best solution for carrying the knife around. The knife is well made and reliable in many outdoor activities. When you take a look at the big picture, you see a strong, reliable and long lasting bush craft knife that handles many outdoor challenges pretty neat. If you want a bush craft knife that is great for batonning, chopping, without being too heavy weight, give it a go with the Helle Temagami Laminated Stain. The knife comes with a triple layered laminated stainless steel blade. The blade is sharp, durable and able to take some serious jobs like heavy chopping or batoning. It’s a half full tang knife, which gives good performances in many situations. The handle is handmade and uses a Curly Birch, American Walnut and leather. The handle looks nice, leaves a nice feeling in the hand and ensures a good grip. The design of the handle minimizes strain of the hand when using the knife also. Each knife comes with its custom full grain sheath. The sheath protects the blade and makes the carry of the knife easier. The knife is lightweight and well balanced. The craftsmanship is good quality and both the knife and the sheath are long lasting. You can use it safely in many survival situations or around the house just as well. All in all, the knife is a lightweight, reliable and quite strong choice to have around when going outdoors. If you want your bush craft to be foldable, yet reliable and instantly ready to help you, don’t hesitate to give it a go with the Fallkniven TK4 Folding Pocket Knife. The knife is a compact folding knife that manages to be strong, yet lightweight at the same time. It has a great design that never goes out of style. The knife stands out with its looks and performances altogether. The back of the blade may be used as a striker for a fire stick all the time, even when the knife is closed. The blade is made of the new 3G steel, which is a laminated anti-corrosive steel with a core that combines the Super Gold Powder Steel with sides of VG2. The blade has a 62HRC strength and gives amazing edge retention. The knife features nail nicks on both side of the blade, so the knife is completely symmetrical and easy to use by left and right handed users. The handle has a slim design so it gives a great comfort in the hand. The grip is sturdy and the handle is made from the tough composite Zytel that is both lightweight and strong. The composite is resistant to solvents and corrosion also. You don’t have to worry about the knife getting unlocked by accident. The locking mechanism keeps the blade secure in its open position. The lanyard hole is another great detail that give you the chance to carry the knife on your belt or backpack. The knife has a good weight and is reliable in so many outdoor activities. But, for the qualities and performances it brings, the knife sure is a great tool to have anytime. The more you want from your bush craft, the more you need to pay for it. The FirstEdge 5050 Survival Fixed Blade Plain Edge Knife isn’t just a knife, but also survival knife that does an amazing job also as a bush craft knife. The knife is strong and built like a tank so that it takes the heavy duty jobs easily, for a very long time. 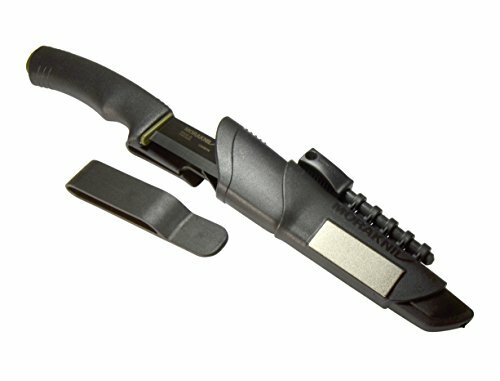 The knife is designed and built together with U.S. Special Forces so it accomplishes their requests and quality needs for a true survival tool. The full-tang construction of the knife is strong and the blade is made of high grade ELMAX steel, with coarse textured G-10 handles. The grip is sturdy, strong and comfortable at the same time. The handle leaves a nice feeling to the hand and the knife is easy to maneuver. The Kydex Tri-Composite sheath may be disassembled for a good cleaning. The sheath is not only protective for the blade, but also very durable and able to handle the most challenging weather conditions. The lanyard hole is functional so that you can easily carry around the knife. The stainless steel Hex fasteners are efficient. The black oxide finish on blade and fasteners complete the looks of the knife and fit perfectly its performance as a survival, bush craft knife. Apart from its rather high price, we have no cons. If you want to stay alive, no matter the outdoor situation, the knife is a tool to have around. 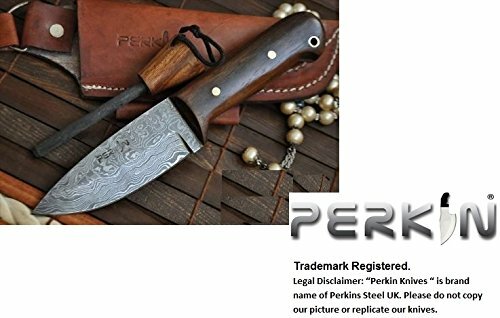 If you like the custom made things and only want what is especially made for you, then you surely will fall for this Custom Handmade Damascus Hunting Knife Beautiful Bush craft Knife from Perkin Knives. 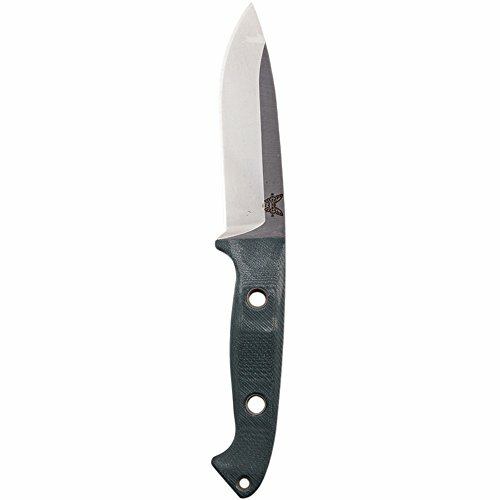 The knife has a great design and features a 59-62HRC strength. The blade is made of genuine Damascus steel. It’s sharp, strong and can be of good use in various outdoor activities. The knife gives a good, comfortable grip that minimizes strain for the hand. It’s a great option when camping, hunting or in any other bush craft activity. In order to complete its special appearance, the knife comes in a handmade leather sheath. The sheath protects the blade and is very well made. As a matter of fact, the whole knife is very well made and the craftsmanship is good quality. The knife is handcrafted in UK and the sheath really is a work of art. The blade is very well done and the knife has a solid feel. The knife has a good weight, considering its size. The balance is good and the knife is comfortable to use. The belt loop is a functional detail that adds up to the good things.